Sky announces the introduction of Sky VIP, the first tenure-based loyalty programme in the TV and broadband sector. A four-tiered programme, the premise is simple; the longer you’ve been a customer, the better the rewards become. Whether you’re a long time customer of Sky TV or you only signed up yesterday - we’ve got some good news for you! Sky TV today launched Sky VIP, a new loyalty programme that rewards customers for being with Sky. The programme was developed following extensive customer research and feedback, which revealed that Sky customers are looking for a variety of rewards. Sky claims that new customers want experience-based rewards, while long term customers want priority service and access to the latest technology. So how does Sky VIP work? Sky VIP uses a four-tiered system based on the length of time customers have been with Sky. The four tiers are Silver (0-3 years), Gold (3-8 years), Platinum (8-15 years) and Black (15+ years). Each tier gives more new benefits, as well as access to the rewards in the previous levels. Customers who’ve been with Sky the longest will be able to access all of the rewards and benefits on offer. Customers can join Sky VIP via the My Sky app to discover the range of personal rewards available to them. On joining, all customers can access a free welcome gift of a Sky Store movie and find out their membership tier, based on the length of time they’ve been with Sky. What can I expect from Sky VIP? Prize draws for extraordinary experiences including an all-expenses paid trip to Iceland to see some of the filming locations for Game of Thrones. Free tickets to major sporting events including the GAA All Ireland Championship semi-finals and finals, the Premier League and EFL, Autumn Internationals, the NFL International Series and European Tour Golf, international and domestic cricket as well as exclusive Sky Sports events where customers will get VIP treatment and hospitality. The opportunity to watch the latest films before anyone else, with free tickets to cinema preview screenings across the country. Free tickets to a range of other special events, which include being in the audience for Sky shows such as Thronecast, Soccer AM and A League of Their Own; tickets to National Theatre Live screenings and tickets to Goodwood. Free Sky Go Extra. Download and watch Sky shows wherever and whenever you want. Sky Atlantic VIP - a new channel where customers can watch some of Sky Atlantic’s new shows 24 hours before they’re on Sky Atlantic, including Sky Original Productions and HBO and Showtime series (excluding simulcast and live shows). 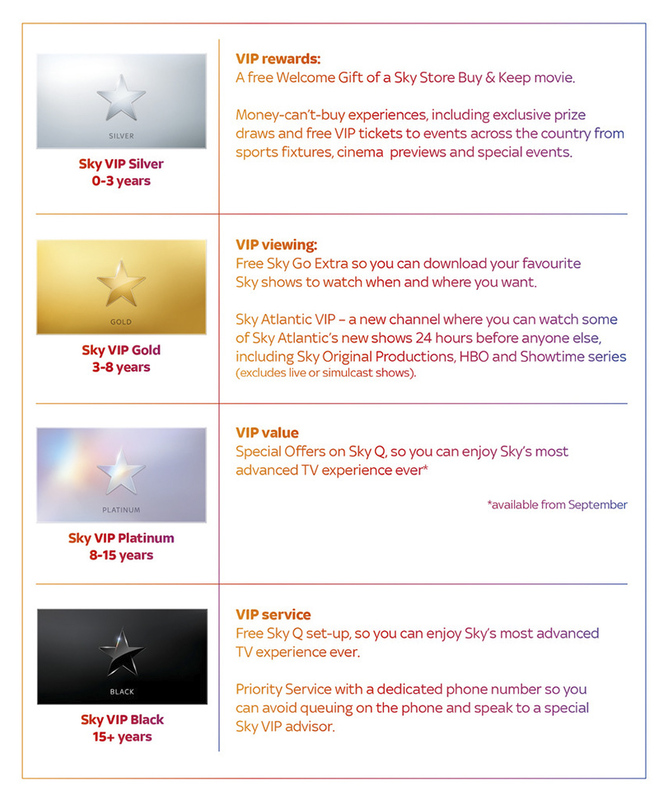 The launch of Sky VIP follows the successful launch of Sky Italia’s loyalty programme and last year’s Christmas gift to customers in both Ireland and the UK, which gave Sky TV customers Sky Box Sets for three months or a Sky Store Buy & Keep voucher. If you like the sound of Sky VIP but you’re not a Sky TV customer why not browse some of Sky’s TV packages? The great thing about the new programme is that you can start benefitting as soon as you become a customer. If Sky’s not your thing, why not compare all TV packages and see what’s the best fit for you.